It is well known for paying a considerably generous amount of money in its bonus round. Now we are not exactly sure what the name suggests. It might be the case that the game is inviting players into a bank heist to gain huge rewards, or that you are about to break your bank with all the money coming your way. Either way, both promise potential big wins. All the symbols within this slot game are quite fitting in the theme. The game’s high paying symbols are represented by a purple diamond as the highest paying followed by gold bars, piles of cash, chequebooks and gold coins. The A - 10 make up for the lower paying symbols. 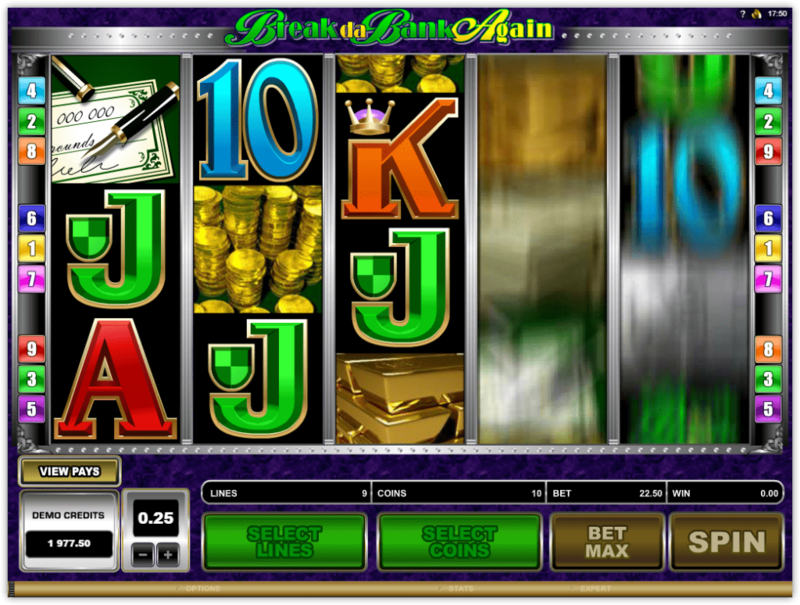 The wild symbol of the game features the Break Da Bank Again logo and it can substitute any other symbol except for the scatter symbol. Any wins in the base game that include the wild symbol are subjected to a 5x multiplier, however this changes in the free spins round. The scatter symbol features a bank vault and landing three or more of them in the view will take the player to the free spins round. The scatter symbol also acts like a scatter in the sense that landing two on your reel will pay no matter where they land. In reality, there is basically one special feature round going on here, the free spins one, and it is quite difficult to trigger. Having said that, you can rest assured that if you hit it and get some wild wins in there, you should win big amounts of cash. 1:2 Card Colour: Guess the colour of the card correctly between red and black. Guess right and double your winnings, guess wrong and forfeit all your winnings. You can either keep guessing until you collect your winnings or until you lose everything. 1:4 Card Suite: Guess the suite of the card correctly between clubs, spades, hearts or diamonds. Guess correct and quadruple your winnings, guess incorrectly and forfeit all your winnings. You can either keep guessing until you collect your winnings or until you lose everything. The number of free spins depends on the number of scatters landed during the base game. Three scatters = 15 free spins. Four scatters = 20 free spins. 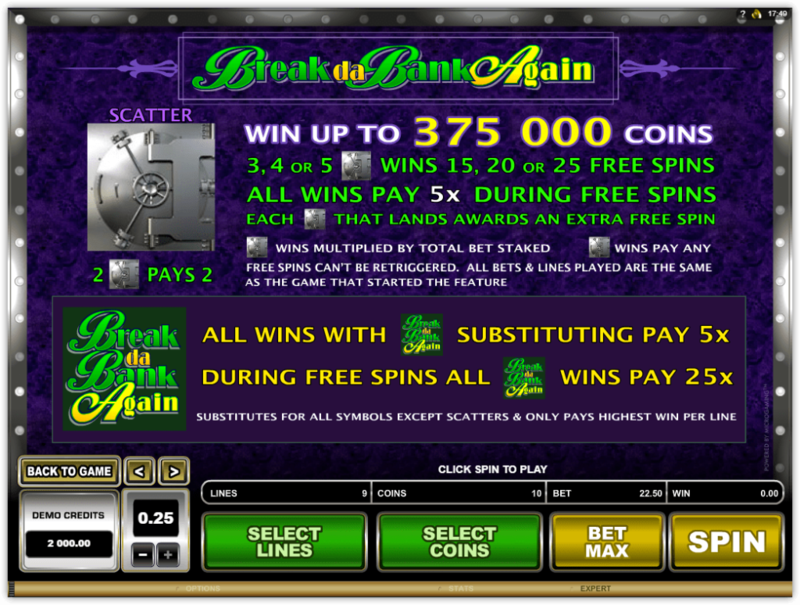 Five scatters = 25 free spins. Landing a scatter during the free spins will give an additional free spin. All wins during the free spins round which have the wild symbol as a part of it are multiplied by a staggering 25x. 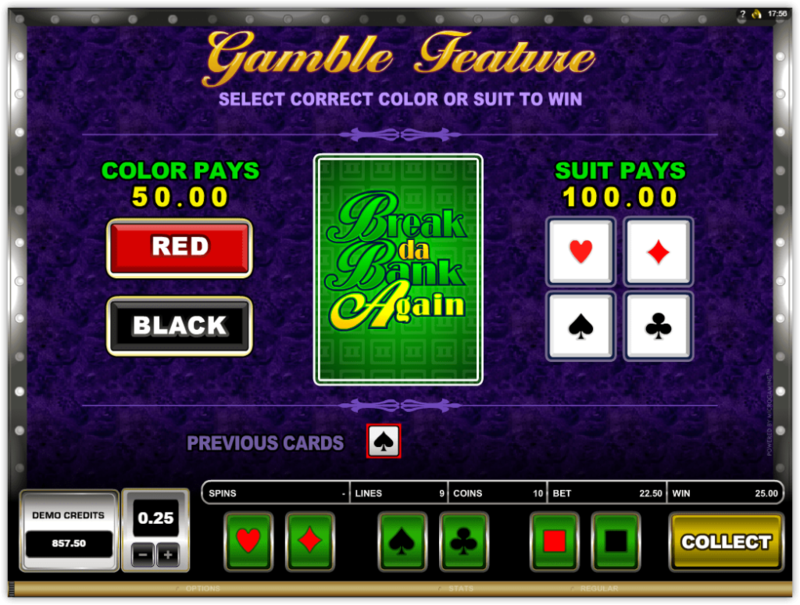 Our first comment here is that this slot game was definitely not created in the past decade. Having said that, the potential to win big is just insane- even on the smaller bets, you can get a good coin. With bets as low as 9 cents per spin, this game is good for those of us who like to spin a lot, but also for our higher risk lovers, due to the awesome potential. Take a look at our own Nickslots winning big in Break Da Bank Again.